The billion-dollar beverage giants have set their eyes on an entirely new industry, an industry that they fear will soon swallow them up if they don’t get ahead of it. So, if you think you missed the cannabis boom…. Now may be the time for you to get in. In a matter of days, Canada will legalize recreational marijuana—and it will be the staging ground for other parts of the world. If even Coca-Cola thinks the cannabis market has “incredible potential”—then it does. While Coke’s September 18th announcement that it was “closely watching” the cannabis market and considering marijuana-infused wellness drinks doesn’t compare to the $4 billion another beverage-maker pumped into a grower, it is still a very big deal. More than any other big beverage company scrambling to get into cannabis right now, Coke lends credibility and legitimacy. This was a major, carbonated nod. If Coke moves forward with this, it would likely consider CBD—a non-psychoactive component in marijuana for an infused drink that could ease symptoms of inflammation, pain and nausea. For Canada’s Aurora Cannabis (OTCMKTS: ACBFF), it was yet another nice boost, because rumor has it that Coca-Cola is in talks with this company. And it’s lost on no-one that if Coke starts dabbling in pot, it will be an easier ride—plus, they’ve got the entire Canadian market to experiment on, with recreational legalization just days away. Canada would be the staging ground for the rest of North America. Wells Fargo is convinced. Its analysts see Coke positioning itself for the long-term here. It also estimates that cannabis-infused drinks are going to be a massive market. They’re eyeing $50 billion in sales annually in the U.S. That would give cannabis-infused drinks nearly half of the entire U.S. beer market sales annually. This is a great time to get in on Coke—before any official decision is made. When you consider the potential size of this market, Coke’s brand new direction could get a major pot bump. It will also have a domino effect: Watch other non-alcoholic beverage makers follow Coke down this path. The playbook is simple: Scythian Biosciences identifies, acquires and flips key businesses - netting a huge profit along the way. It just cut the best cannabis arbitrage deal in history, and somehow it is still under the radar—but not for long. Aphria gave Scythian 15.7 million shares of stock to incubate cannabis assets, right before the first pot rampage exploded. That’s a 6.3 percent share in arguably the strongest cannabis producer in the world—and it also makes Scythian the largest single Aphria shareholder. When the deal was agreed upon, those shares were trading at CAD $12, worth $193 million. At the time the deal was closed, Aphria shares were trading at CAD $17.78, making Scythian’s position worth over CAD $278 million. That’s a massive payoff, all in a day’s work. And that’s what Scythian is brilliant at—it’s a world class incubator and this is its third win-win deal in a row. Forbes is all over it, and everyone else will be soon. Forbes is right, too. From a ground-floor investment perspective, this isn’t just a big deal—it’s possibly the most mouth-watering arbitrage event in this rapidly transforming sector. Right now, the market is paying attention to Aphria because the deal gave it “access to world-class assets” in the “most advanced regulatory jurisdictions across LATAM and Caribbean markets”, according to Forbes. It gave them first-mover advantage in Argentina. It gave them market leadership in Jamaica, and gave them Colombia—the prime agro setting with export channels to the rest of Latin America. And while the market is busy looking at Aphria, Scythian —a very smart and sophisticated incubator of cannabis assets—is stuffing its war chest full of Aphria shares soon convertible to cash. This deal should put little-known Scythian Biosciences on the cannabis map—in a very dramatic way. It may be the best kept secret in the cannabis sector. But there’s another big potential catalyst coming, too—in a matter of days or weeks, Scythian is looking to acquire an exclusive medical cannabis license in Florida. Ahead of that licensing, Scythian took a controlling interest in 3 Boys Farms LLC—an established Florida medical cannabis company and primary care medical organization. North Americans spent $53 billion on marijuana (most of it illegal) in 2016, according to ArcView Market Research. When the U.S. side of the legal market opens up, Scythian will be there too. These are floodgates, and they could unleash serious market attention for Scythian Biosciences —which has a valuation more than 70 percent higher just on the Aphria deal. It’s coming from publicly traded companies acting as incubators, like Scythian Biosciences. But, because this space is so new, many investors don’t yet understand the profit potential of this new breed of company...And that's opened up a huge opportunity for investors that do. Scythian is a credible international incubator. It’s also the world's first global cannabis incubator, and they've already made some game-changing deals. Diageo was the third major alcoholic beverage company to focus on pot. It’s the maker of Guinness beer, Smirnoff vodka and Johnny Walker, and it’s already been in talks with at least three Canadian marijuana growers. It wants a piece of the action quite desperately. Now the speculation is about which grower it’s going to choose, so everyone’s watching those stocks as well. The speculation so far centers on Aphria (again), Tilray (NASDAQ:TLRY) and Aurora Cannabis (NASDAQOTH:ACBFF). Aphria seems to have the advantage because it’s market cap is lower than that other two—considerably. Aphria’s market cap is around $2.7 billion, while Tilray’s is about $14.4 billion and Aurora’s is over $8 billion. It also offers a better price per kilo of capacity than its peers. Perhaps more suggestive still, Aphria already has ties to Diageo through a former Diageo exec who now serves as Aphria’s chief commercial officer. For the UK beverages giant, getting into cannabis seems to be a must. The Trefis price estimate for Diageo in the last week of August was $157—that’s about a $20 upside from the current price of $138.50. For growers right now, it’s all about expanding capacity. Canopy’s Canadian platform is now 57 percent licenses “with the balance under aggressive development towards the previously announced 5.6l million sq. ft. target production footprint”, the company said in a statement on September 17th. They need this much capacity in order to meet expected demand come October 17th, when Canada fully legalizes recreational pot. All in all, Canopy’s stock has gained 98.5 percent this year. Canopy Growth (NYSE: CGC) PT is being raised at Garnier to CAD$95.00 (from CAD$51.00). But that’s not the only catalyst—it’s just the newest. Beverage giant Constellation Brands, Inc. (see below) announced recently that it will inject some $11 billion into Canopy over the next three years. That’s got investors drooling over the expansion prospects. And in August, Constellation pumped $4 billion into Canopy, raising its shares to 38 percent from 9.9 percent. All this activity has even earned Canopy the moniker, “the Google of pot”. Some analysts will argue that if you want to make money on Canopy, you should buy into Constellation as the less risky play in an emerging industry. After all, this gives you an in when pot is legalized, and if anything goes wrong, well, you’ve still got stock in a really solid beverage company. This is for the risk-averse investor who isn’t looking to make big money on cannabis—just a bit of a bump. And, indeed, the fundamentals for Constellation look pretty good. 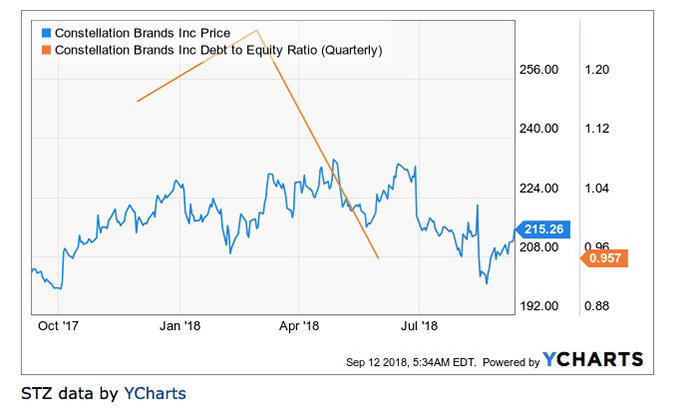 The 12-month potential price target for Constellation Brands, Inc. is set at $247.53—a target price that suggests an upside potential to increase by 14.6 percent from the current price. Village Farms International (TSX:VFF) is a broad agriculture company that specializes in greenhouse cultivation of various products, from tomatoes to cucumbers and peppers. It is also one of the first greenhouse growers to join the U.S. Hemp Roundtable. iAnthus Capital Holdings (CSE:IAN) is a U.S. based cannabis company listed in Canada. The company has recently taken an interest in cannabis-based businesses in four U.S. states. This interest saw its stock price jump at the end of 2017 from below $2 up to its current price of over $5. It recently completed its acquisition of Pilgrim Rock Management, LLC, a management and services company that provides intellectual property licensing, professional and management services, real estate and equipment leasing, and certain other services to Mayflower Medicinals, Inc. In iAnthus’ recent earnings report, the company highlighted significant growth in its Florida-based GrowHealthy branch and it’s Massachusetts-based Mayflower Medicinals branch. Cronos Group Inc (CSE:MJN) is another Toronto-based cannabis company with a lot of ambition. The company has prioritized its production acquisitions in order to provide geographically diverse products. Loaded with values, this company is comprised of passionate and focused employees. One of the primary objectives of Cronos Group is to destigmatize the medical use of marijuana and bring medicine to those who need it. Cronos Group has made it their priority to lead as an example for the industry and provide the best care possible to the community. Since it’s February listing on the NasdaqGM exchange, Cronos has seen its share prices nearly double, and its moves in the medical field, including September’s insomnia study with Aleafia have secured its upward momentum. Harvest One Cannabis (TSX.V:HVT): Harvest One Cannabis Inc, formerly Harvest One Capital Inc, is a Canadian company focused on servicing both recreational and medicinal markets. Harvest One recently raised $25 million in equity financing and $9 million will be used to finance Phase 1 production capacity expansion at United Greeneries’ Duncan Facility. Harvest One has seen its share price increase in September and we think the company is well-positioned to take advantage of Canada’s looming legalization of recreational marijuana. Namaste Technologies (TSX.V:N) is an international e-commerce cannabis company operating in 20 countries. Currently, the company’s primary market is in Canada, though as laws evolve around the world, Namaste is well positioned for expansion.